One day a while ago I was playing around with one of my own heart patterns and the thought came to me to try out making feet with them. It took me a bit to wrap my mind around that because I didn't think it would really work even though I really wanted it too! But amazingly it worked out and so simply too! The hearts kept their shape even without much effort but I did add an optional way to shape the feet if you have any troubles with them. Just read through the legs section before starting. Scroll down this page for the bear pattern. Each row has a sequence as given below. Example: 1sc then 2sc in next st means repeat that sequence 1sc then 2sc in next st followed by 1sc then 2sc in next st over and over to the end of that particular row. The number inside the parentheses ( ~ ) is the number of stitches you you should have in that particular row. you can use buttons, a french knot or paint eyes on. I used safety eyes that I glued in place. I used 10mm for the bears pictured. The head and body are worked in one piece. If you plan to use safety eyes they are placed in between the 12th and 13th row with 7 visible stitches between them. The top of the muzzle is placed on the 12th row. Whip stitch a nose in place before sewing the muzzle to the head. I sew the muzzle on after the doll is stuffed and closed up but some prefer to sew it on before. It's just a matter of preference. The legs can be done 2 ways. One is just stuff and shape the heart and the other is add in a heart shaped plastic mesh sheet, one that fits exactly inside the heart then stuff. The red heart feet are just stuffed with no plastic inside. The purple hearts I added in the plastic sheet then after the leg was closed up I shaped the heart further with a strand of purple yarn. I entered in where the #1 arrow is pointing, came up and out on #2, back in on #3 and then out through #4. Knot off the yarn tails, cut up shorter then push them inside to hide them. This made the top of the heart more pronounced. Legs: start with red *make sure to add in a marker and move that marker at the end of every row. *make sure to add in a marker and move that marker at the end of every row. 5) 1sc in next 2st then sl st next st and f/o leaving a tail for sewing. Place the hearts wrong side together and whip stitch the back loops together. Stuff the heart before completely sewing closed. Once stuffed finish whip stitching, knot off and hide yarn tail inside heart. 1) Sew the legs flat to the underside of the body so that the bear sits with the hearts upright. 2) The arms are sewn under the head, I sewed mine one ring down from the top of the neck. Add a stitch or 2 from under the arm to the body to tack the arm down if they are flaring out too far. 3) Whip stitch a nose in place before sewing the muzzle to the head. Stuff the muzzle and use lots of pins to hold it in place before sewing. The top of the muzzle is placed on the 12th row. 4) Sit the bear down and see where the tail will look best then pin it on, ues lots of pins then sew it in place. 5) Pin the ears on top of the head and play around with placement before sewing them in place. Wonderful, I like all your patterns. You're one of my favorite designers. You're so generous giving your patterns for everyone. Thank You! This is an adorable pattern, I can't wait to try it. I would love to have your confidence to publish creations. These are adorable! I love all your patterns! Thank you so much for sharing and allowing us to enjoy your work on many levels! Such a wonderful pattern, that as soon as I saw it on Facebook I started to crochet it immediately! I just discovered your patterns on Ravelry and your blog recently and I love it. Your videos are so helpful and clear, I learnt a lot from them:) Thank You Sharon! What size hook would you recommend as a substitute for 4.5? For some reason all I can find is 4.25 and 5.0 mm. I'm in the US. Not sure if that has anything to do with it, or if the problem is with my local shops. I used a 4mm on a yarn requesting 5mm, worked great, still a decent size bear, I don't crochet lose, but wanted to make sure the stitches were extra tight. I'm a stickler like that. is there any way to make the feet for the bunny in this video with out the hearts in them ? What size eyes do you use for your bears? Hi sharon.how i make double height teddy? I don't know why, but Google is giving me a heck of a time trying to post this! I love your creations! 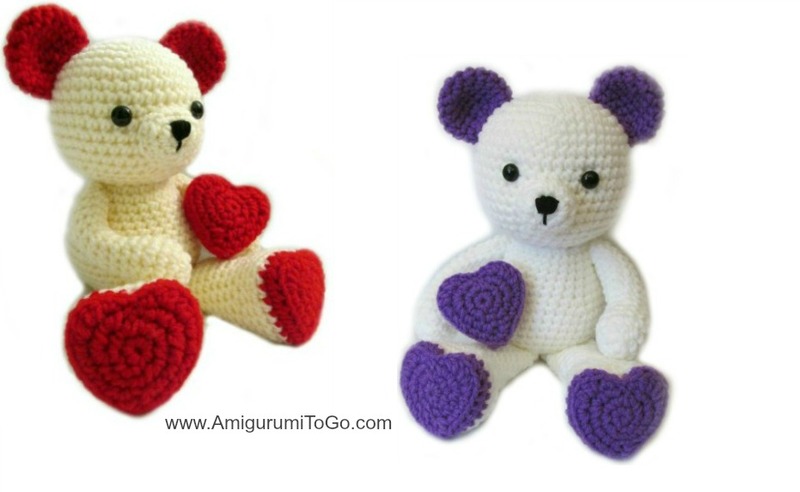 I'm planning to make a teddy bear using your pattern for my niece. I was wondering if the Dress Me Bunny clothes would fit this bear (but with the round feet) or if I would be better off following the Dress Me Bunny pattern and just using the bear ears instead? Thanks so much!!! You have to use the same weight yarn and hook size for the dress and overalls that you used to make your bear with and they will fit. Thanks for the kind words. Have fun! There must been a glitch for you when you tried. I just tried it and it worked fine for me. With the foot, it says BLO....am I correct to assume that stands for back loop? Hello again. I seen the video(s) If you are planning to translate anymore of my patterns please speak in your introduction where the pattern came from and that you are translating with my permission. I am getting messages already from people that you are taking my patterns and translating them. I had to tell them that I gave your permission to do that. In the future if you say it (say my name and my website) people will know that you are being honest. I looked under your video and I see my website but there is no link to the original pattern like I asked. If English people see your video and look in the description box it will be nice to click a link that brings them to the pattern. Always make sure others know where credit is due then there is never a problem. I think you will get more and more comments about it if you don't say anything about the pattern designer(s) in your introductions. I love your pattern. Thank you so much. I got one question in the leg. There are 18st in the 3rd row. When I finish the 4th row, I used 17st and became 25st. It is differernt with your description used 18 st and became 26 st. Please correct me if I am wrong. If you had 17st when you finished that row then you skipped a stitch somewhere. If you need help with those few rows maybe watch the video, it should help you get through. The link is just above the leg pattern. And also watch carefully where your hook is going, this part of the foot is tricky and you can end up with a different stitch count than the pattern. I just finished the bunny version of this and absolutely love it! I would post a pic on your Facebook but it won't let me :(. Thank you for sharing all of your hard work, you have inspired me on so many levels. I saw your video yesterday and since then have made 3 wee bits and am now working on this bear. The day before yesterday I only knew how to do a chain stitch and a single crochet. Thank you, God bless. Thank you so very much for sharing your patterns with us! This pattern is the cutest! There's only two tiny changes I made. I did an invisible decrease instead of sc2tog (pick up front loops only of the next two days yo pull through both front loops yo and finish single crochet) and I decreased the number of sts by half last round of the limbs and made jointed limbs instead. After that it's perfect and I love it. Thank you for sharing your patterns! The videos were very helpful as well. It is a perfect gift for my granddaughter. 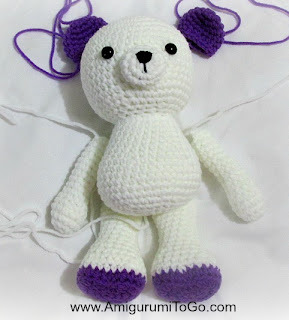 I am getting the supplies ready to make this adorable bear. The only thing is you mentioned "2 different colors of Red Heart worsted weight acrylic yarn (one skein of each will do)" in your pattern. Is this 7 oz skein? Thank you for your help. I actually use Red Heart Comfort yarn and those come in jumbo rolls. If you used the same, then way way less than those rolls. I don't measure exact amounts. If you want to use regular rolls, (I always compare regular rolls to Red Heart Super Saver which have apr 364 yards in them) then one skein for the main color and you only need a small amount for the ears and heart shapes, so anything you have on hand or a small amount of one reg skein for the alternate color. Thank you for sharing your lovely patterns. They're fantastic. I was wondering if I can get permission to pass along your bears to the local victim's services as a donations as part of my Buddy Bears Organization. I've made a couple and given them as gifts...but it never hurts to ask. If you're okay with it, I'm happy to put a button with a back link to your blog, facebook page, etc on the website I'm currently making. Thank you again - your designs are easy to follow, easy to make, and a lot of fun to do. Absolutely! I actually have no restrictions on my patterns. People are free to do what they like with their finished items. It's a lovely cause you are donating to, thank you for doing that! OH My Goodness!!! I am having a blast making the Teddy Bear. I am loving trying different color combinations. My Mother In Law fell the first of August and fractured her shoulder and has been at my house mending. Home Health has been coming to rehabilitate her and they have all been so nice that I thought I would give each of them a little token of appreciation. So I am making each of them a Valentine Bear. Patricia I must say your are awesome!! Your patterns and video instructions are so easy to understand for a semi novice crocheter. Thank you so much for sharing your wonderful work with fellow crochet lovers. Thank you so much for your website and youtube videos! 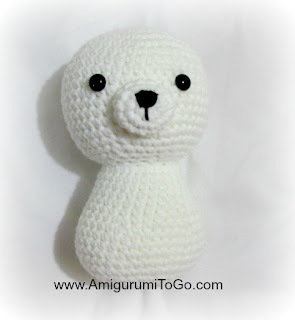 As a complete beginner, I've ordered and tried a few amigurumi kits and failed each time until I saw one of your videos. Everything was like a foreign language until I watched your videos - and I only needed to watch two of them (magic circle plus another random video) to start understanding! Your patterns are so cute and I hope you continue creating more and keep them free. That said, if you ever decide to publish a book, even one that compiles these free patterns, I would happily purchase one. I made the valentine bunny as my second completed amigurumi. Had to give him a scarf as he looks a bit skinny; need more practice on the tightness of stitches. Thank you for this amazing pattern (it will be the second time I make one). I had a question I am hoping you can help me with. I am looking to make this little bear for my loved one for Christmas but am not sure how to process. I was thinking of using the Christmas scarf and hat patterns from the Remember Me bear. Would the accessories fit this Valentine bear? If not would using a bigger hook help or would I have to change the stitches count? I wish you well and look forward to your response. I'll give it a go and will post the finished product on your Facebook. Thank you for the pattern! For the Heart Pillow, can you please explain what you mean when you say in Row 4 to put a single crochet in the top and bottom of the half double? It feels like I'm not understanding correctly because my count is off. Thank you! the heart pillow is the same as the heart shaped feet and I showed how to do those stitches in the video tutorial. You would just have to fast forward the video until you get to the feet. It would be easier to show than explain it here. I hope that helps! I was wondering if possibly you could help me make the bear a bit bigger? Or a suggestion on when to increase the stitches to accomplish that! You are my inspiration Sharon, Thank you for all you do! You could try a thicker yarn. Bernat blankets makes awesome stuffies! Thank you! Your pattern was easy to follow and the bear came out ADORABLE! Hi Sharon, Thank you so much for this adorable pattern. Did you attach the heart pillow to the bear, or is it left detached? yes, you scrolled by the link. Scroll back up, under the first photo at the very top I have short paragraphs with bold headings, look for "Video tutorials" the links are there. I love this little rabbit. I have her crochet, I just have to assemble her. 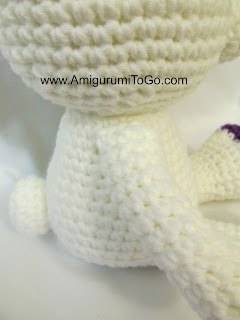 I am going to crochet your spring dress pattern for her. Thank you so much, you are so creative. Thank you so much for sharing the pattern. I made one for my mother. You should make patterns like this inspired by your little bigfoot animals. A pig with heart shaped feet would be really cute. So would a panda, moose, puppy, or any of your little bigfoot animals.